Good Times is a microgame found in WarioWare: Touched! in the Slightly Unscrewed stage. It reappears in WarioWare Gold, where it is one of Kat and Ana's microgames. The objective is to set the time that matches the Top Screen. This game has twice the time to complete. 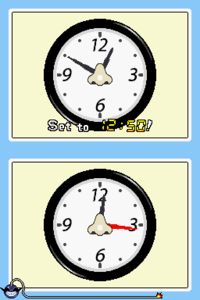 In WarioWare Gold, an analog clock with the correct time is shown on top-left corner of the large clock in the 1st and 2nd level difficulties, and a digital clock with the correct time is shown in the top-left corner of the large clock in the 3rd level difficulty. 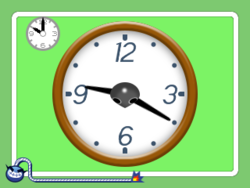 1st level difficulty: The time is close to the shown time. 2nd level difficulty: The time is far from the shown time. 3rd level difficulty: The time is very far from the shown time. This page was last edited on February 18, 2019, at 16:42.